In the construction of artificial pond is a very important step is waterproofing. By far the most best and durable material for insulation is film. It is easy to lay and install, environmentally friendly and retains its appearance for many years. 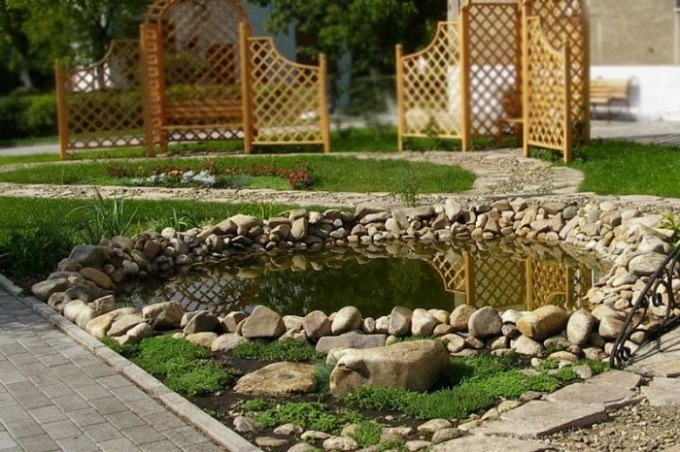 The advantages of films for ponds, in addition to their ecological compatibility and durability, and that with their help you can create a pond of any shape, depth and size. A good film is resistant to sunlight, high pressure and temperature, it is possible to stack and glue even in winter. The material is also favorable for breeding fish and plants. The film material is protected from the harmful effects of ultraviolet light and algae. The film is selected depending on the depth of the pond. If water depth up to 75 cm and fit the PVC film thickness of 0.5 mm, if the depth of 1.5 meters, in this case more appropriate PVC film with a thickness of 1 mm, and for ponds with a depth above 1.5 m it is recommended to use butylcatechol film EPDM. Best to lay the film in one piece, but if this is not possible, the film can be glued and to achieve the desired size. Before gluing it is necessary to clean the surface of both pieces of material from dust and dirt. You should also handle the bonded pieces of the cleaning composition. Place in the pit for the laying of film should be clear from stones and roots of trees. The bottom should be better aligned and to make a sand pillow. Under the connector region of the films it is necessary to enclose the Board. After finishing work they can't be removed, eventually they will rot. Then place two pieces of tape overlap one another (overlapping width should be not less than 7.5 cm). The bonding film, plastic foil uses a special adhesive based on neoprene or ribbon, which consists of the same components as the film. PVC films are best connected to each other with glue sealant or a special glue (for gluing PVC). Further, the adhesive is applied with a layer thickness of 1 mm, and at once on both sides that need to be glued. It is necessary that the time of drying coincide. You need to give about ten minutes for drying glue and to connect the upper edge of the film from the bottom. Then laminate the entire surface of the bonding silicone roller, first crosswise and then lengthwise and gluing the seam along the entire length. It should be enough to press hard on the roller, leaving bubbles and creases. At the final stage of bonding is necessary to go around the seam edge sealant and spread it with a plastic spatula. Thus, the result is a reliable and smooth connection.